Sealing your home can have many benefits including preventing dangerous scorpions and spiders from entering your home. Other benefits of home sealing are reduced energy use, prevention of water entering your home. Water can not only cause damage, but create conducive conditions for mold, fungus, and termites. Call ProBest today for a home seal service. Home sealing is a part of Integrated Pest Management and prevents the entry of pests into your house and or property. A ProBest home seal includes sealing cracks, gaps and holes on the exterior of your home, screening vents and windows properly, sealing doors and windows and placing or repairing property walls. We offer home seal to protect your house or business from the Arizona Bark Scorpion through the Phoenix and surrounding cities that include Gilbert, Mesa, Chandler, Queen Creek, Apache Junction, Gold Canyon, Johnson Ranch, Buckeye, Avondale, Surprise, Sun City, Glendale, Peoria, Deer Valley, Scottsdale, Tempe, Maricopa, Casa Grande, Tucson, Flagstaff, Sedona, and Prescott. Investigate louver attic vents and weep holes. 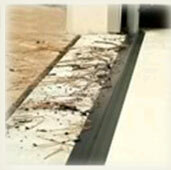 Inspect door frame and door thresholds. Check garage door seal, trim and molding. Ultimately caulking breaks downs, whether its the heat or movement of the home. So before we begin our sealing we apply a dust combination of (DE) Diatomaceous Earth and Delta Dust. We will attempt to dust any crack, pipe or hole opening. If or should I say when the caulking breaks down there will be a barrier of dust and this dust should remain good for a very long time. A return visit usually about 2 months to check on caulking, this product tend to retract a little. So a secondary visit is suggested to double check the sealing process. A warranty is available with a yearly renewable option, includes a visit to check on all work previously installed. Seal J-trim, against the foundation with clear caulking. We do not seal the round small holes, this allows the walls and home to breath and allow water condensation to escape. Seal pipe penetrations, a/c, electrical and plumbing. Use hardware cloth to seal louver and/or weep holes. Seal door frames, window frames and door thresholds with clear caulking. Seal eaves, fascia and other boards that may allow entry by scorpions. Does your garage floor get wet and dirty from wind-driven rain, dust, dirt and leaves that sneak in under your garage door? Do even the smallest cracks and gaps at the bottom of your garage door provide an easy point of entry for dangerous scorpions, spiders, rodents, snakes and other insects? Then ProBest Pest Management has the answer! 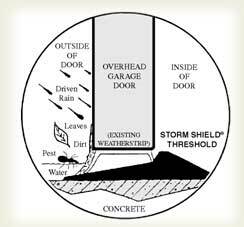 This garage door threshold effectively and efficiently keeps out, water, wind-driven rain, snow, mud, dirt, leaves, rodents, snakes and insects by simply creating an impenetrable seal between your garage door and garage floor—helping to ensure that your garage stay dry, clean and rodent free! More durable than door-mounted weather-stripping, our floor mounted, and precision-engineered vinyl threshold provides a tight fitting, long lasting barrier between your garage door bottom and the floor. The weight of the door presses down on it to keep out most rain, rodents, leaves and insects. Over time other parts of the garage door wear out, moldings and seal weatherstripping and those can also be replaced/upgraded by ProBest.